The US department of trade asked American industry what the president should extract from a post-Brexit Britain. The office said it was “seeking public comments on a proposed US-UK Trade Agreement, including US interests and priorities, in order to develop US negotiating positions”. Organisations were invited to submit their responses in writing or verbally at a public hearing – and the responses were startling. • Removal of protections for traditional British products. Unlike in the US, many hormones are banned in the UK as they are deemed harmful. The National Cattleman’s Beef Association have demanded that US standards be recognised in Britain, in a move which could pave the way for hormone-riddled meats being sold to British consumers. They asked for “mutual recognition of equivalence in safety standards” in their submission. The National Cattleman’s Beef Association also spelled out exactly what the US farming industry wants from a UK-US trade deal: an to beef subsidies in the UK. British farmers are heavily reliant on government cash so this would threaten to put them out of business. US beef farming, which has access to vast land resources and operates on lower standards, would have a distinct advantage were subsidies cut. As it stands, any new genetically-modified crop sold in the UK must be rigorously tested and will be clearly labelled. The UK has a mandatory labelling scheme for genetically-modified food so people are informed about what they are eating. The National Confectioners Association, which advocates for the $35bn US confectionary industry and whose motto is “always a treat”, wants to see it scrapped. Britain’s chemical market operates using the EU’s “precautionary principle”. It means the UK takes a safety-first approach to regulation and guards against letting anything into the market which could be dangerous. But the Society of Chemical Manufacturers, which represents over 150 firms involved in the $300bn US chemical industry, told Trump to target this in trade talks. Lots of US lobbyists want negotiators to pressure Britain to scrap protections for British produce which regulate how they’re marketed. The ‘Geographical Indicator’ regulation, currently guaranteed under EU law, stops much-loved products like Stilton and Cornish pasties being imitated by American firms, or indeed anyone, so it’s easy to see why US industry would want rid of it. The National Milk Producers Association says the UK should be made to “remove currently imposed EU policy restrictions on the use of common cheese names in UK market” to shift the UK closer to World Trade Organisation rules. The US pharmaceutical business lobby wants to change the British system for evaluating drugs in a way that would suit American firms. The Pharmaceutical Research and Manufacturers of America berates the NHS’s current risk-averse system, designed to guard the publicly-funded service against paying for ineffective and overpriced drugs, as “rigid” and a “blunt containment tool”. Your eyes do not deceive you: pus and hormones. Hormone-treated milk is common in the US but banned in the UK. BST hormone can cause unnecessary suffering to cows and lead to significant amounts of pus finding its way into their milk. But the National Milk Producers Federation and the US Dairy Export Council want UK regulations to mirror America’s so US dairy products can be sold here. “The main objective in a US-UK Trade Agreement should be a truly mutual and comprehensive recognition of our dairy safety systems,” the NMPF said. ... where it would not necessarily be protected. The EU and UK is currently pursuing laws which would prevent data from being transferred across borders to other countries where regulation differs wildly. However, the US tech sector wants a new rule which would override any such law in a UK-US trade deal. BSA - The Software Alliance says the deal should “obligate the parties to permit the cross-border transfer of data” and “prohibit data localisation requirements”. A group of American unions is demanding all disputes relating to the US-UK trade deal “shall be settled by state-to-state arbitration” - so, by politicians not judges. The AFL-CIO group’s ask would vastly restrict the ability of individuals and companies to seek remedies and would mean governments, rather than independent legal experts, make binding rulings on whether the terms of the trade deal have been observed. A separate investor-state dispute settlement scheme has also been suggested for a US-UK trade deal. This one, suggested by the powerful Security Industry and Financial Markets Association, would allow multinational companies to sue the Britain over regulations or interventions the state makes in the country’s or citizens’ interests. A crucial difference of this scheme would mean cases would not be heard in the British courts but in arbitration courts which are not subject to domestic law. In a recent case in a similar scheme, the Australian government was sued under a similar mechanism for trying to remove branding from cigarettes, for example. Concerns have been growing over the role social media has played not only in damaging young people’s mental health but a huge range of issues plaguing modern life, including a resurgence of sexism, racism and harassment. Debate continues to rage over how best to regulate social media firms, like Facebook or Twitter, but the US tech lobby wants Trump to curb whatever route the UK eventually chooses. The Computing Technology Industry Association says negotiators should ensure “the UK does not adopt measures that would impose liability as a publisher, creator, or speaker of information on third party distributors or intermediaries of that information”. This would prevent the British government from trying to hold tech firms to account for what they publish after any US-UK trade deal. US confectionary firms want to see regulation rolled back so they don’t have to make UK shoppers know what colourings are in foods. This would risk preventing shoppers knowing whether they are buying sweets and chocolate containing chemicals and E-numbers. The National Confectioners Association have said that “US industry is hopeful that a US-UK trade agreement can achieve progress to rescind the requirement for mandatory warning labels for certain colours used in confectionery that are approved for use in the European Union and by many governments around the world”. The growth hormone ractopamine is banned in 160 countries, including the UK, Russia and China. US farmers add it to pig feed to keep hogs’ meat lean but the hormone comes with health concerns, both for humans and animals. In pigs, ractopamine is associated with hyperactivity, trembling, and broken limbs. But the National Pork Producers Council said that the UK ban would act “as a major impediment to US pork exports to the UK, confining US exports to a small group of suppliers”. Fears are growing worldwide about the spread of antibiotic resistance. The World Health Organisation has cited it as one of the biggest problems the globe faces in 2018, with concern rising that doctors will find infections more difficult to treat if the drug stops working. NHS chiefs have warned antibiotic use in farm animals “threatens human health” and Britain and the EU are close to bringing in regulation restricting its use. But the National Pork Producers Council wants Trump to guarantee the UK does not regulate so it can sell antibiotic-filled meat to UK customers. Trichinae are parasitic roundworms sometimes found in pigs, which, if digested by humans, can cause serious health problems. Because of this, it is law that all British and EU pork must be tested for trichinae. But the National Pork Producers Council have told the US government it should make the UK do away with testing. “US negotiators should ensure that the UK eliminates trichinae testing requirements for pork as part of a US-UK free trade agreement,” it says. British law states that meat for consumption cannot be washed with with antimicrobial products, including chlorine or bleach. Environment Secretary Michael Gove has ruled out a post-Brexit Britain importing this kind of meat due to public health concerns, but US lobbyists will push the President to ask. 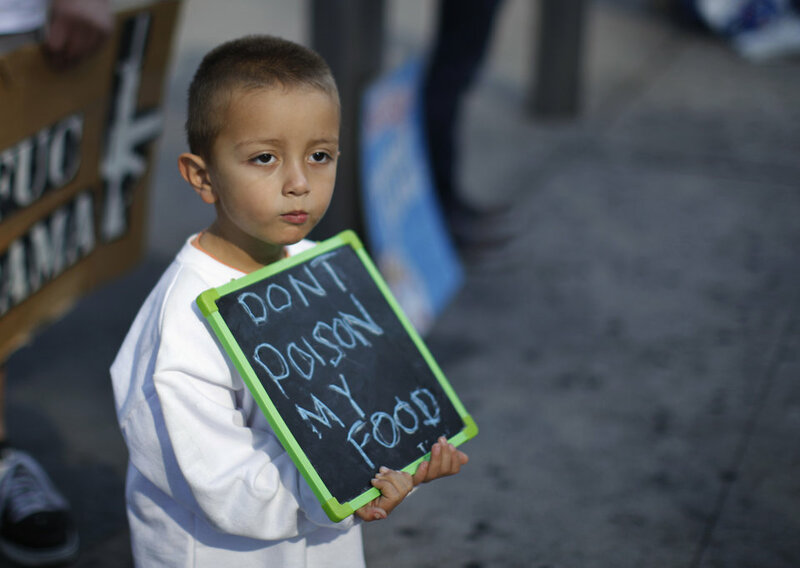 Many food pesticides sprayed on US crops are deemed too dangerous in Europe. Neonicotinoid pesticides, for example, are thought to pose risks to bees so are currently banned, while widely used in America. The US Grains Council thinks the UK has to change its outlook to fit more closely with American rules. It told the consultation regulation of pesticides has “the potential to negatively impact future US grains exports to the EU”. Strict limits are imposed on how much pesticide residue can be on fruit and vegetables by the time they reach supermarket shelves in the UK. But the American Pistachio Growers think this is a bad idea and a “potential barrier” to the easy flow of trade. The American Pistachio Growers want UK law to change so that products rejected for containing carcinogenic aflatoxins can be “reconditioned” and put back in to the UK market. Direct selling, or multi-level marketing, is associated with unscrupulous companies. Though not illegal, it is tightly regulated in the UK. Amway is an American company which specialises in this model of marketing to push health, beauty, and home care products to people in their homes and workplaces. Its distributors, or as it calls them “independent business owners”, market products directly to people and can sponsor and mentor others to become “independent business owners”. It has been investigated by the Federal Trade Commission and various countries to see if it is a pyramid scheme, though has not been found guilty. Amway wants Trump to ensure safeguards on direct selling are lifted in the UK. The libertarian lobby group Americans for Prosperity, founded by the Koch brothers, wants the UK to accept all products made in the US to lower standards. It wants Trump to guarantee the UK accepts all of the US standards and regulations using one “mutual recognition” clause in any UK-US deal. Chancellor Philip Hammond is exploring how the UK can tax big online businesses like Google and Amazon more fairly, such as via data storage and processing. The drive for a so-called ‘Amazon Tax’ has followed a decade of austerity and stands in sharp contrast to gargantuan profits of online firms, many of whom are accused of paying poverty wages and offering poor working conditions to staff. The US Council for International Business disagrees big firms should pay more. Lead and cadmium are poisonous substances, which is why the UK regulates the amount in glassware intended for contact with food. In America, they aren’t so careful. Firms look only at how much these poisons leech into food rather than how much of them are present. Massachusetts glass company Libbey Incoporated prefers the less safe approach. In the US, some medical devices have been immune for testing because they are “substantially similar” to something already in use. There have already been cases where a device considered to be exempt was later found to be dangerous. The US Chamber of Commerce would like the UK to adopt similar rules. The US Chamber of Commerce has hinted that it wants to force the NHS to pay more for drugs. The Advanced Technology Association - which is the largest medical device association in the world - simply wants to make sure the NHS pays as much as possible for US-made medical equipment. It says “one of the principal negotiating objectives of the United States” should be “to achieve elimination of government measures such as price controls and reference pricing which deny full market access for United States products”. UK laws on waste are designed to minimise how much electronic waste ends up in landfill sites or incinerators. The National Association of Manufacturers, however, says that “unnecessarily restrictive, non-science-based regulatory approaches” are tough on manufacturers despite, it admits, being based on “possible” risk.